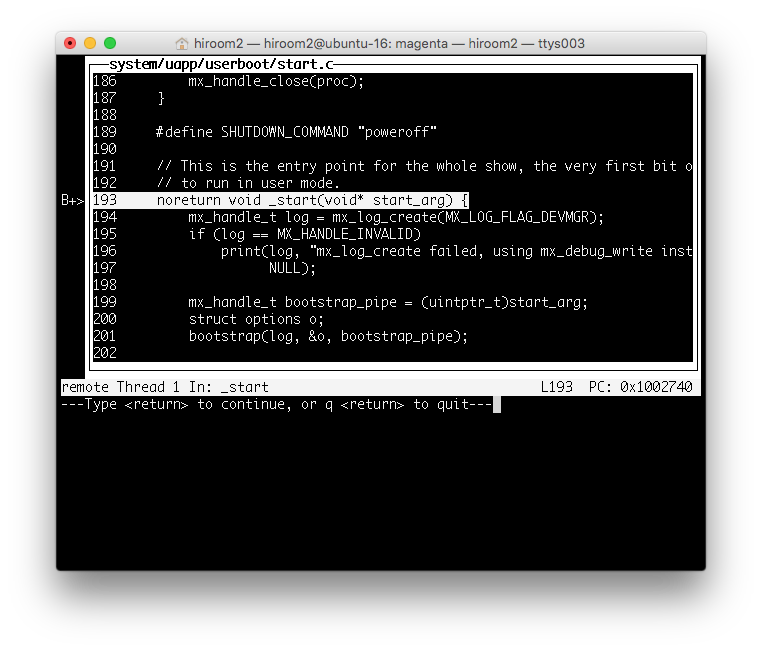 This article will describe building Fuchsia and debugging with GDB-stub. The arm32 has a problem with deadlock of spin_lock on 2016/8. Install packages for building Fuchsia. This will be stored at prebuilt/downloads. The GDB in prebuilt/downloads does not have layout command. This article will use layout command and build toolchain. Building toolchain will take about 2 hours. Build binary of target board with make. The binary will be stored at build-<target>. The list of <target> is as below. Running make without target will use magenta-pc-x86-64. The QEMU in Fuchsia's repository has few patches. Build QEMU in Fuchsia's repository and install it. The arguments of script are as below. 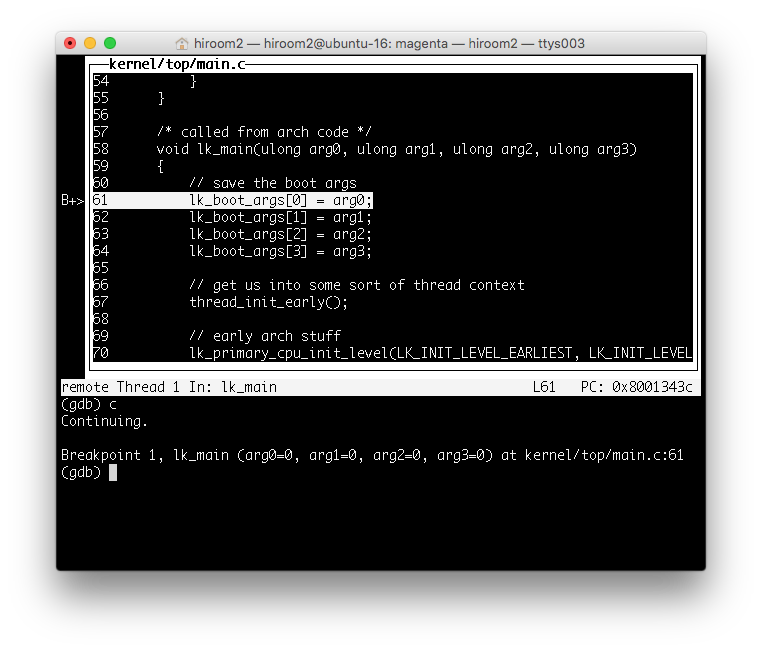 This article will debug kernel and uapp with GDB-stub. Change QEMU script as below. echo "-u                  : use uniprocessor"
echo "-v                  : use vnc based display"
echo "-x <bootfs>         : add eXtra bootfs"
+    echo "-G <port>           : gdb port"
echo "all arguments after -- are passed to qemu directly"
+    ARGS+=" -gdb $GDBPORT -S"
Run QEMU with -G option. x86_64-elf-5.3.0-Linux-x86_64/bin/x86_64-elf-gdb will cause below error. This article will use gdb64 in Ubuntu 16.04 because it will not cause error. Use the following GDB script. In case of scripts/run-magenta-arm64, please use gcc_none_toolchains/aarch64-elf-5.3.0-Linux-x86_64/bin/aarch64-elf-gdb. After running arch-depend assembler, lk_main function will be called. GDB break at lk_main as below. The userboot is a program running from kernel to userspace. This looks like init programe in Linux. The load address of userboot (uapp) will be output. Add userboot (uapp) symbol with add-symbol-file in GDB script. When running QEMU and GDB, GDB break at _start function in userboot (uapp) as below. It might be enable to debug bin/devmgr if knowing load address (This article cannot get load address).